ServiceMaster DAK will coordinate all of your electronic recovery cleaning and drying services for both our commercial and residential customers. ServiceMaster DAK understands that electronics exposed to contamination including, water, soot, smoke, dust, mold and other substances must be quickly addressed to avoid permanent damage. Fire soot and smoke residues contain acids that will corrode metal surfaces and are conductive therefore must be removed quickly. Electronics faced with water damage need to be dried in a controlled environment and then cleaned of contaminants for best results. 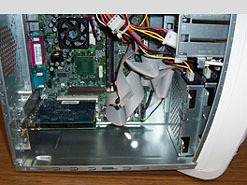 Electronic equipment cleaning and restoration is a very specialized field. We have the contacts that will respond like us 24/7/365 to provide the emergency service you’ve come to expect from the partners in service at ServiceMaster DAK. ServiceMaster DAK will coordinate and respond quickly, working diligently to ensure that your cherished items are restored to their pre loss condition. Contact ServiceMaster DAK for all of your electronic equipment restoration needs.